Thus even though the stories look similar, the rationale for the flood in the Hebrew Bible was written to spread a different theology. In the new movie, Noah gets dreams of the flood and after consuming some hallucinogens at his grandfather Methuselah’s place, finds the answer: build an ark. He builds the ark and along with his family — wife Naameh, sons, Shem, Ham and Japheth, Shem’s wife Ila — and his nemesis Tubal-cain, take off as the floods hit the earth. Oh, before that there are some scenes involving rocks which also shape shift like Optimus Prime who protect Noah and help him escape. While the animals lie sedated, there is lot of drama on board the ark. There is Tubal-cain tempting Ham to murder his father because Noah did not get a woman for Ham. Then there is Ila, who springs a surprise on Noah, when he thought that she was barren. Finally there is the psychopathic Noah, who eagerly waits the birth of his grandchildren so that he can murder them. Finally, all ends well. Tubal-cain is murdered by Ham. Ila delivers twin girls and as Noah goes to murder them, he has a change of heart and unlike Abraham who was willing to kill his son, he spares his grandchildren. The flood stops as well and the human race is saved. While the director claims that he has stayed true to the Bible, the Christian conservatives have found numerous issues with the film based on the Hebrew Bible. According to a creationist, “Noah is an insult to Bible-believing Christians, an insult to the character of Noah and, most of all, an insult to the God of the Bible.” One of the issues is that Noah has a problem with carnivores. It is Tubal-cain, who argues to the contrary that God had given dominion over the entire planet to humans. The suggestion that the movie is pro-environment, pro-vegetarian had many in knots. But then in Genesis 1, God had commanded humans to eat plants and it was only after the flood that they were permitted to eat meat. As Prof. James Tabor suggests, if only people read the Bible. For example, the film never mentions God and referrers to him as the Creator. For the Turkish, Chinese and American evangelists, this movie may have been offensive, but for people interested in the history of how the Hebrew Bible was written, this is good time to watch or read the transcript of this lecture which talks about the contradictions within the Bible as well as within the flood story. Did the Creator ask Noah to bring two pairs of each living being or seven pairs of pure animals and one pair of impure animals and seven pairs of birds? In some places the flood was for 40 days and few lines later, it was for 150 days. All of this, for a historian, leads to the documentary hypothesis, with multiple authors and revisions. So far it was believed that the Catholic Church was against fascism during the 20s and 30s, when Mussolini came to power in Italy. Newly revealed documents state otherwise. NPR had an interview with David Kertzer, the author of the new book The Pope and Mussolini: The Secret History of Pius XI and the Rise of Fascism in Europe and here are some interesting points from the transcript. The popes had seen the Italian government as enemies, basically. They had rejected the notion of the separation of church and state, they had lost their privileged position in society, and they had always called that system illegitimate. Pius XI at least began to see the possibility that Mussolini might be the person sent by God — the man of providence — as he would later refer to him … who would reverse all of that, who would end the separation of church and state, restore many of the prerogatives of the church and at the same time, as the Pope was very worried about the rising socialist movement … saw Mussolini as the man who was the best bet, perhaps, to prevent a socialist takeover of Italy. The church got financial benefits, considerable payments by the state to the Catholic clergy. … They got, for example, as the fascists were forming fascist youth groups, which millions of youth in Italy were a part of in those years, the church was given chaplains to all the local chapters of the fascist youth groups so that they were able to influence the youth, which was very important to them. They also got as part of the Concordat, the fascist imposition of teaching religion in elementary schools, which was one of the first things Mussolini did to ingratiate himself when he came to power — to extend that to secondary schools as well so that all the school children in Italy were taught Catholic religion in their school. One of the most dreadful accounts of people stranded helplessly in the ocean that I have read is in Unbroken: A World War II Story of Survival, Resilience, and Redemption by Laura Hillenbrand. In this true story, Louis Zamperini, whose performance in the 1936 Olympics caught the attention of Adolf Hitler, crashes into the Pacific on a search mission during WWII in a B-4. While the crash killed eight of the eleven men on board, Zamperini and two of his colleagues float in the open ocean on a life raft. For 47 days, they caught fish, evaded sharks and Japanese bombers and miraculously survived (One of them, Francis McNamara, died after 33 days) to wash up into a Japanese POW camp in Marshall Islands. Five years after Zamperini’s unplanned voyage across the Pacific, a Norwegian explorer and writer named Thor Heyerdahl, set off on a voyage from Peru to Polynesia. Heyerdahl had a theory that Polynesia was populated not from Asia, but from South America. The early explorers to Polynesia had found pineapple, which was indigenous to South America. Also, certain sculptures found in Polynesia resembled the ones in pre-Columbian Peru. Though his theory was dismissed by academics and the National Geographic Society, because people at that time did not have boats required for such long distance travel, Heyerdahl believed that the rafts they had were sufficient and the ocean current would have favored such a travel; he believed that ancient Peruvians did not see water as a barrier. To prove this, he decided to travel 5000 miles in the Pacific, on raft made of balsa wood and assembled using the same materials the ancient explorers would have used. With private funding, supplies from the United States Navy, and with a crew of six people, he set off to prove this theory. This Norwegian movie is about that voyage and was nominated for the Best Foreign Language Oscar at the 85th Academy Awards. Heyerdahl did not go full commando on this voyage; the crew carried radio equipment, watches, charts and sextants, but that did nothing to minimize the dangers of the voyage. There was the possibility that a storm would wash them back into South America or taken them into Galapagos. They survive few storms and soon encounter giant sharks which swim below the raft; there is some stunning photography at his point as the camera goes below the waves. They survive the shark attacks, even going as far as harpooning one and bringing it on board. While there were concerns that the wood was absorbing water and becoming heavy, they eventually figure that they are along the right path. Soon they spot land, and just few days before India got independence, they land at Raroia. 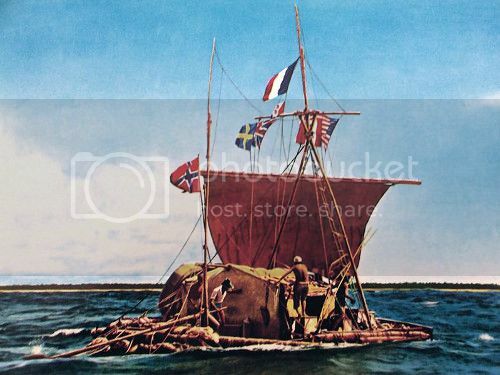 Though Heyerdahl proved that you could travel 5000 miles in the open ocean in a balsa wood raft the his theory that Polynesia was populated by South Americans never found acceptance. The dominant theory seems to be that Polynesia was populated from South-East Asia.